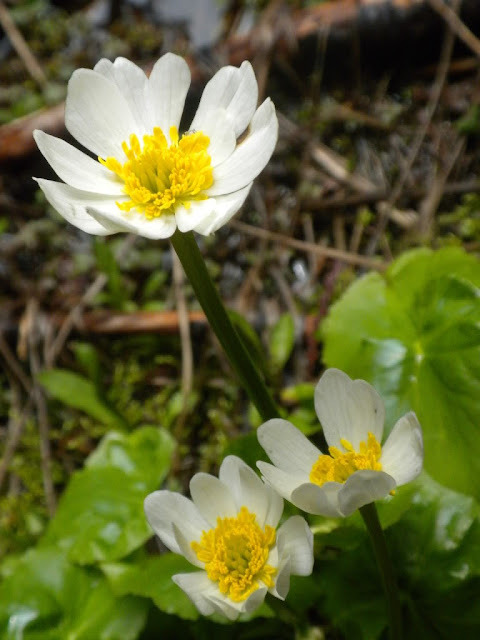 I had no idea what this flower was called, but have found a very handy site that has photos of Pacific Northwest wildflowers, and easily found out it is a Marsh Marigold. The description on the site says its often found at the edge of snowmelt, which is very true. Thats is exactly where I found these! Wow I didn't know there is another kind of marigold and this is very pretty!! So pretty! It almost looks like a strawberry flower... or other berry flower! Our marsh marigold are yellow, I like your white ones! Same here... I only know of yellow marigolds too. Glad to see its other variety from here. Great one!